On Friday 14th September 2018, Imperial College London (IMPERIAL) were honoured to welcome senior representatives, including the Vice President, from the Industrial Technology Research Institute (ITRI) based in Taiwan. This presented an exciting opportunity for the two institutions to discuss possible collaborations going forward. As part of the visit, ITRI’s technical team were invited to participate in an EDEN2020 ‘Stake Holder Engagement Workshop’, chaired by our project PI Prof. Ferdinando Rodriguez y Baena. 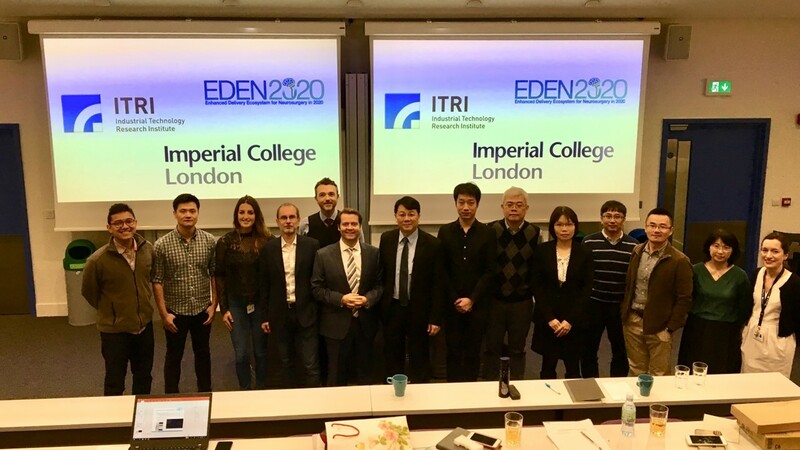 Presentations and discussions between members from IMPERIAL and ITRI took place and provided a platform for EDEN2020 researchers to consider how best to engage with its stakeholders and what are the processes and improvements needed to bring EDEN2020 to market. This was a valuable session for all involved and built on EDEN2020’s aims to increased outreach and engagement.